The Lower Platte River Corridor Alliance exists to foster the development and implementation of locally drawn strategies, actions, and practices to protect, enhance, and restore the vitality of the Lower Platte River's resources. The Lower Platte River is one of Nebraska's most unique and populous areas of the state. With diversity in natural, cultural, economic and social resources, both opportunities and challenges abound. With collaboration and participation by the Corridor's residents, stakeholders, and the greater public, the LPRCA can continue to protect, enhance, and restore the wealth of resources. Our website furthers our mission by providing ways for you to learn more and get involved. We hope you'll spend some time learning about the LPRCA and the Lower Platte River. Thanks for visiting. The LPRCA holds regular semi-annual meetings. The meetings are open to the public and we always welcome and encourage the many and diverse stakeholders of the Lower Platte River Corridor to attend. We also encourage individuals to contact us with a discussion item or presentation that they would like considered for placement on our agenda. The last Meeting was held on Wednesday, October 24, 2018 at 10:00 a.m. at Lower Platte South NRD office in Lincoln. The next LPRCA meeting is scheduled for sometime in April 2019. Meeting details to be determined. Agendas and minutes are posted to the website on the home page, the Regular Meetings page and in our Newsroom. We hope to see you at the next one! The LPRCA partners with the United States Geologic Survey to provide water quality information in real-time. Find out the current water quality in the Lower Platte River and tributaries! USGS developed predictive data for e-coli, phosphorous, atrazine and other contaminants. The National Weather Service displays flow conditions at gage sites throughout the Lower Platte River. Click on each gage to find the current river flow data. 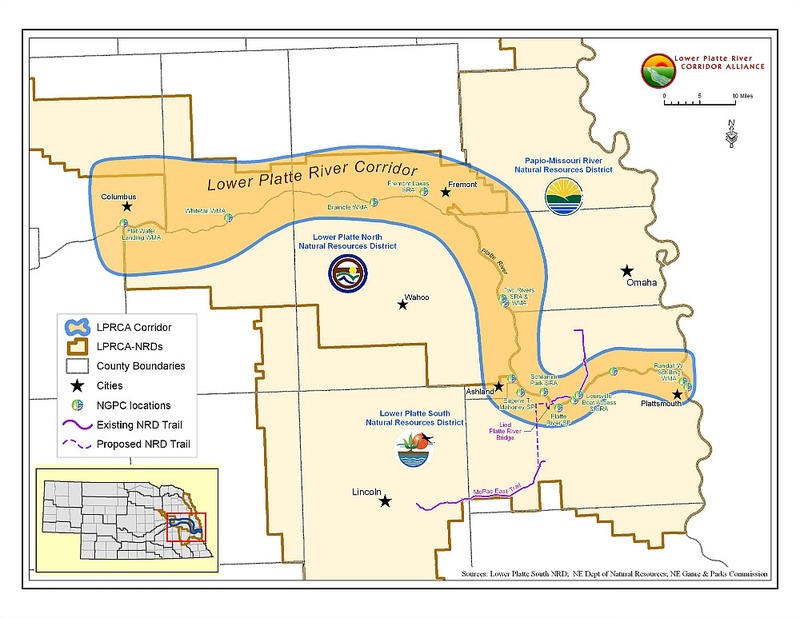 The LPRCA in partnership with the United States Army Corps of Engineers (Corps) and the Nebraska Game and Parks Commission (NGPC) has developed a comprehensive recreation plan for the lower Platte River. The results of this study, as well as maps, figures, goals, and recommendations, can be found on the Platte River Recreation Planning Study section of our website. The Nebraska Game and Parks Commission has created an interactive Trail Viewer. It includes trails all over Nebraska with the ability to search by surface type, location, and name. It also includes information on trail length, amenities, and street view pictures of the trails. A cooperative project between renowned photographer Michael Forsberg and the University of Nebraska Nebrasaka Educational Television providing timelapse images for points throughout the entire Platte River Basin. The geospatial data that has been collected and/or developed for or by the LPRCA is located on an ESRI platform for sharing LPRCA data for viewing and creation of maps by users. The map galleries represent many of the Lower Platte River Corridor Alliance projects. The Interior Least Tern and Piping Plover Monitoring, Research, Management, and Outreach Report for the Lower Platte River has been published. Click on the banner above to download and view the report. The LPRCA produces a newsletter, Platte River Update. The most current and past editions can be found in our Publications and Resources portion of this site. If you would like to receive a print copy, please provide your contact information through the "Get Our Newsletter" link at the very top of this page or in the "What You Can Do" Section of the site. If you would like to submit an article please contact the LPRCA directly!